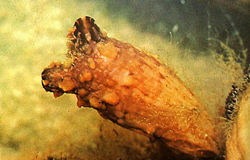 The tunicate, also known as the "sea squirts" are best known for their vast colors and unique shapes and sizes. The tunicate will usually stay in one place most of their life, living on rocks, towards the bottom of the ocean. Tunicates sometimes form large colonies, where they all live together, very tightly. There are a vast number of varieties of tunicates including the blue bell tunicate (Clavelina puertosecensis), the light bulb tunicate (Clavelina oblonga), the translucent tunicate (Ciona intestinalis) and more. Interestingly, some parts of the tunicates can be used for medical purpose to fight cancer. Anatomy of Animals author unknown, accessed: October 22, 2008. Chordates author unknown, Angel Fire, Accessed October 22, 2008. Tunicate Fact Monster, Pearson Education, Accessed on October 23, 2008. 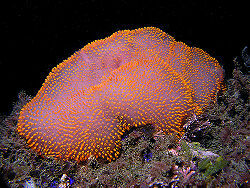 Tunicates Allison Merritt, Accessed on October 22, 2008. Tunicates-Encyclopedia Article "Tunicate," Microsoft® Encarta® Online Encyclopedia 2008, © 1997-2008 Microsoft Corporation. All Rights Reserved. Accessed on October 24, 2008. Tunicata (Subphylum) © 2004-2008 the BayScience Foundation, Inc, Accessed on October 25, 2008. Introduction to the Urochordata Copyright 1994-2008 by the Regents of the University of California, all rights reserved, Accessed on October 25, 2008. This page was last modified on 26 July 2014, at 11:45.